Watch as the seismic waves make their way across the USA. Red denotes upward motion, Blue is down. One of the more popular items we sell at Spectrum are pens that use invisible ink that only show up under ultraviolet light. The most popular ones actually have the ultraviolet light built right into the pen! We recently added the new Ghost Writer as our latest Invisible Ink/UV light pen. The Ghost Writer has all the features of older models but at a much lower price (under $4!). It has the invisible ink pen, the regular pen head, and the ultraviolet led flashlight. Batteries are included! To use it, all you need to do is write whatever you want. You won’t be able to see it of course, its invisible! But then you shine the ultraviolet light onto the paper and voila! Round bottom flasks are most often used for heating or chemical reactions. Their curved bottoms mean that there are no corners for materials to get stuck in, nor hot spots or weak points to form. Round bottom flasks are often part of systems and so while many have 1 neck, others designs may have 2 necks or 3 necks! These necks often have glass joints for joining to adapters and tubes. Since they are used for heating or must join with other glass lab systems round bottom flasks are almost exclusively made of borosilicate glass. The big disadvantage of round bottom flasks is that they can’t stand up on a table on their own. They require a lab system to support them or use of a flask stand. Flat bottom flasks are round flasks, usually 1-neck, that are used for heating in distillation or other reagent reactions. They are not as durable as round bottom flasks but don’t have the sharp and vulnerable corners of an Erlenmeyer Flask.Their flat bottoms do allow them to stand up on a hot plate, shelf, or table. Volumetric flasks are use to make compounds to a decent degree of accuracy (the accuracy depends on Class ‘A’ or ‘B’ quality). To ‘operate’ a volumetric flask you put the correct mass of a compound (powder, concentrated liquid, etc) required to make a 1 molar, 2 molar, etc. mixture and then add water to the line marked on the long neck. The long neck and stopper (every Volumetric flask should come with some kind of stopper) allow for vigorous shaking to make the mixture. Volumetric flasks can be made of glass or plastic since they are not used for reactions or heating. Plastic is less expensive but more prone to staining, and it is also not as accurate. hose runs to a vacuum pump that pulls the air out of the flask. When this happens a special funnel system (sometimes just filter paper) sitting on top of the flask. The pump pulls the liquid and smaller particles through the paper and into the flask. The larger particles get left behind on the filter. Filtering flasks need a lot of strength so they are built out of glass and have much thicker walls than their regular Erlenmeyer flask counterparts. We’ve recently added a nifty outdoor toy: The Water Rocket by 4M. The concept is one you might have seen in smaller form: you pump up a model rocket that has a small amount of water inside. The pressure builds up a lot from your pumping and when you release the valve the high air pressure pushes the water out of the rocket. When that happens, good old Action/Reaction takes place to launch the rocket into the air. This kit make a larger water rocket using a soda bottle and some parts to assemble it into a launchable rocket. The only thing not included is a bicycle pump – one that works a Presta valve (most do these days). Once the rocket is assembled you pump it up and launch it up to 100 feet in the air! Please be sure to be outdoors. This kit is a great entry into soda bottle water rocketry, don’t forget that you can buy a great instruction book to take things even further and make super soda bottle rockets! OK. 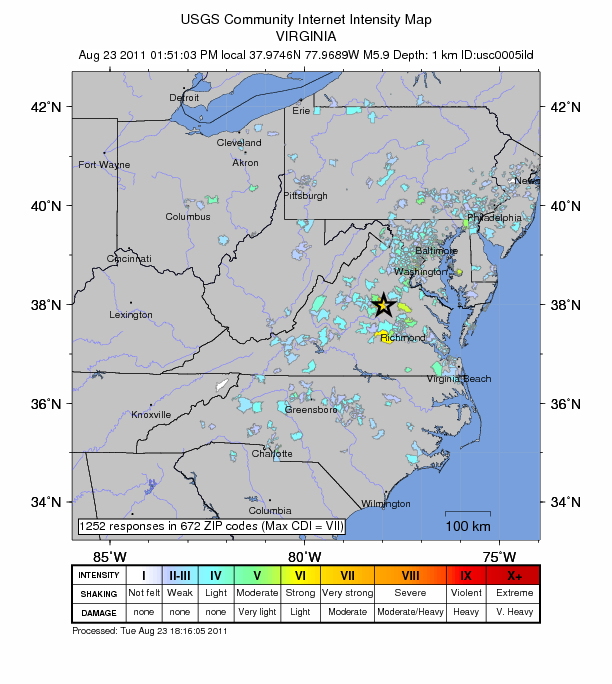 So we interrupt today’s blog post to tell you about a (realitvely) rare 5.9 Earthquake centered in Virginia. We felt this guy in Philadelphia, as our building shook for a few seconds and the top floors made some odd squeaking sounds (or store is in a fairly old building). Fortunately no damage was reported in the immediate area. Now while some folks on the West part of this country may scoff at Earthquakes, even a 5.9 can get their attention. In any case things seem to be back to normal around here, but there may have been some damage locally around the epicenter. As we noted in our previous blog entry on the price of Neodymium the cost of Neodymium has skyrocketed this year due to a combination of increased taxing in China, restrictions on exports, and other causes. It has had a bit of an effect on casual use of Neodymium magnets as toys – the very popular BuckyBalls, for example is facing its second price increase this year alone. The manufacturer is reacting to the price increases by producing a lower cost product with fewer magnets. 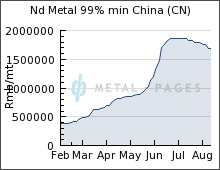 The ‘good’ news is that is seems the price of Neodymium may be leveling out. That of course is somewhat bittersweet news. This leveling out has taken place after the price has increased 3x-6x-fold depending on how you measure. Will the price go down? Hard to say and we are lovers of science, not economists. We can say that there are signs that companies in countries outside of China are a little tired of China having such a monopoly and are taking matters into their own hands and starting mining and production facilities. We are taking these developments as a sign that prices are expected to remain significantly higher than they used to be in the recent past for the long term. Otherwise such dollar investment in production would be a dangerous play if this were a bursting price bubble. China says they plan to use the new tax towards new pollution controls, and has little reason to ease its export restrictions after just a few months. Domestic companies’ production efforts are unlikely to cause a bubble burst as they will not be producing rare-earth magnets to glut-inducing levels. One other thing to consider is that despite these massive recent increases, Rare-Earth magnets are still much cheaper now than they were in the past. A glance at a science catalog from the year 2000 (before Chinese production really ramped up) shows that a 1″ disc magnet cost $13.95! A comparable product after the recent price increases only costs just $5.99. In another comparison, a 1″ disc made of Samarium Cobalt (another type of rare earth used for magnets – less powerful but able to resist high temperatures) cost nearly $50 in 2000. Neodymium (Rare-Earth) magnets are many times more powerful than regular magnets. They are not only used in toys, but also in hard-drives, hybrid automobiles, and a host of other devices in our everyday life.